It's been a crazy day today. I've had so much going on. Madison one of my 5 year old twins caught pink eye yesterday at school. I was at Urgent Care last night with her. I also found out she has an ear infection. Poor Baby! So she is home with me today. I decided we would craft today to help keep her occupied and this would help her from wanting to rub her eye. So I looked around on a couple of challenge blogs and this is what I came up with. I'm also posting the card she made for me. 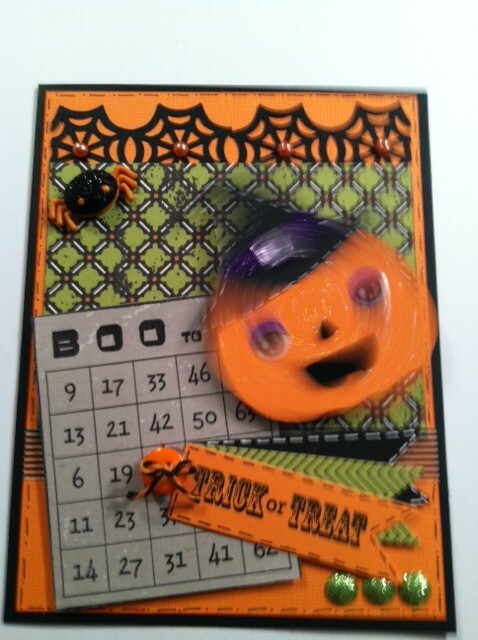 I thought we would make some fun Halloween cards using my new Create A Critter 2 cartridge. Madison loves a card that wobbles! So I added an action wobble to this cute pumpkin. 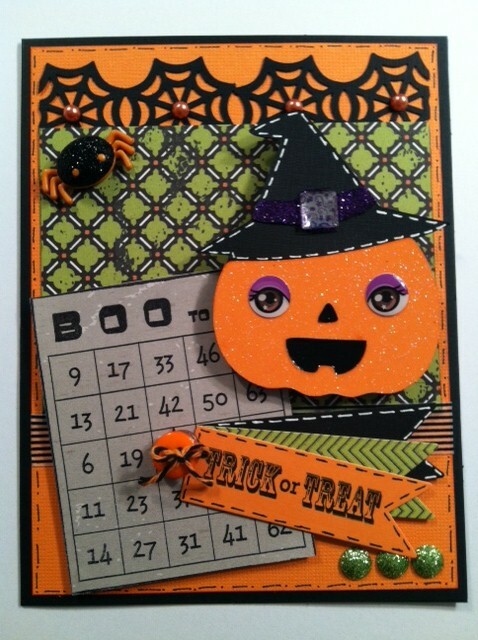 I love the bright orange glitter paper from DCWV Bewitched Cardstock Stack. There's alot of bling on this card for the challenge "Bling It" at Cardz TV. 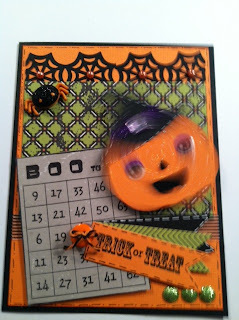 I love the Halloween bingo card from Mary's new stamps. Here's Madison's card she made for me. Everything I was using she also needed and then some. I cut out the ghost for her and helped with the ribbon but she did everything else. I had to laugh at her also adding the stitching around her card. I love it!! Please remember my two blog candy giveaways end this evening and I'll be posting winners in the morning. I have an upcoming follower giveaway that you won't want to miss. I'll be posting details soon. Your card is so adorable - I love that the pumpkin is on a wobble! Madisons card is darling too! 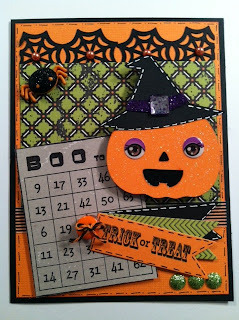 Wow, your card is soooo cute, love how you used Mary's stamps, great job with all that bling! Thanks for joining CTVS! Great card, Madison. Mom's is fabulous, too. Thanks for playing along at CTVS. Sorry to hear Madison is not feeling well. You better watch out mommy, looks like you have a little crafter in the house. Both cards super cute. This card is absolutely adorable! Your ghost and stitching is awesome. Thank you so much or joining our challenge at Cardztv Stamps! Awww poor baby. Hope she gets to feeling better soon. Tell her that I love her card. She did a fabulous job. Your card is great too! Love, Your card!! Sorry to here your little one has pink eye, yuck. Here card is cute, I just adore little children handwriting and crafts. You already follow my blog I now follow You :) !!! You have a super cute blog love it. Very cute cards.Madison you did a beautiful job on this card.Hope you feel better soon.My son loves making cards with me also and he is the same age. What a great project, perfect for our Bling It Up Challenge! I love how you used the Bingo card stamp! Madison's card is SO adorable too! You have quite the crafter on your hands. I hope she feels better soon. Thanks for playing with us at Cardz Tv Stamps. OMGISH How adorable!!!!!! I truly love it Tara! And an action wobble too??? Super! Thanks for playing with us this week at Cardz TV and thank you so very much for putting my 200 follower giveaway on your side bar! I appreciate it!!! This is so cute I just love all the Halloween colors you used. 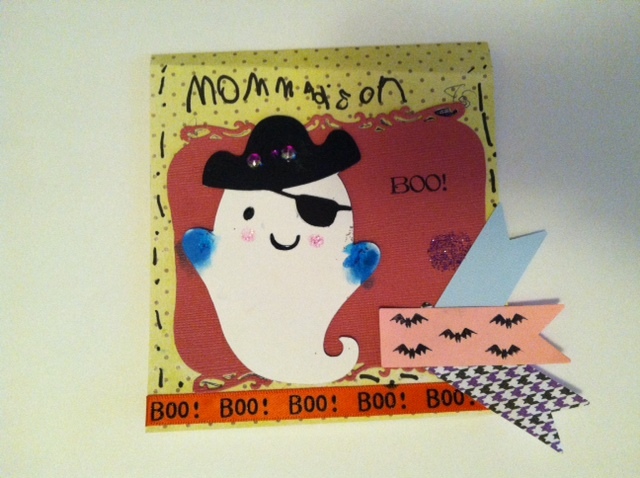 Great Halloween cards! Hope you little one is feeling better! Great project and colors. thanks for joining us this week at CTVS for the Bling it Up challenge. Very cute. I love your wobble cards. CAC2 is such a great cartridge. I hope your little one is feeling better soon!! Thank you so much for joining us at CardzTV Stamps Challenge. Great card! I love the pumpkin! Thanks for joining us at CardzTv.